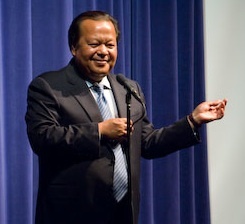 Prem Rawat, the internationally-known teacher who has addressed 4.5 million people around the world on achieving inner peace and contentment, recently brought his special insights and perception to Nova Southeastern University, a stop on a national collegiate tour that also included the University of California at Berkeley and the University of Colorado at Boulder. Speaking before a capacity audience of students, faculty, and guests, Prem Rawat questioned the modern obsession with external goals as the path to personal happiness and fulfillment. 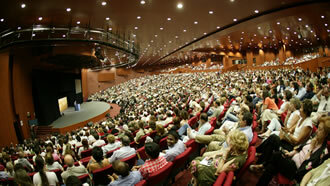 "We do so much to fulfill ourselves on the outside," Prem Rawat said. "We create massive institutions as we seek to expand our outer horizons, yet overlook our inner horizons. It's perfectly fine to learn about the world, but we must also learn about the heart because true peace is not found outside. Within the heart of every human being lies the possibility for being fulfilled and discovering what is real in life." In an address covering many aspects of the contemporary quest for a more fulfilled existence, he placed particular emphasis on "the importance of recognizing what it means to be alive" and the need to strengthen the search for peace within first. "Right now there are a thousand explanations for why we should have wars, but hardly any about why we should have peace. With all the research that is done to efficiently destroy one another, there should be some research done to understand how we can save each other." "Try to live your life more consciously. For every day, for every breath, be thankful."